We install quality upvc box sash windows which are made to measure and as they are constructed from the very latest upvc technology, they offer great performance and provide excellent energy efficiency. This stylish and traditional looking window is often suited to replace timber box sash windows and as our sash windows are available in many colours and wood grain finishes, they are becoming more preferable to conservation areas and buildings where like for like window replacement is required. Our box sash windows are available with a variable transom drop to your specification and boast the usual extras like sash horns and Georgian Barr. 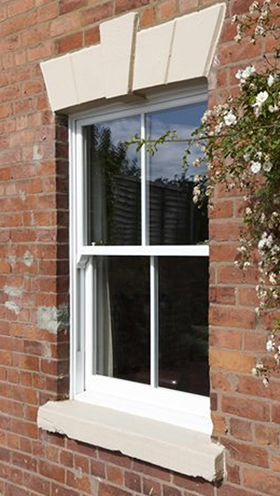 Call today for a no obligation quote for sash windows.